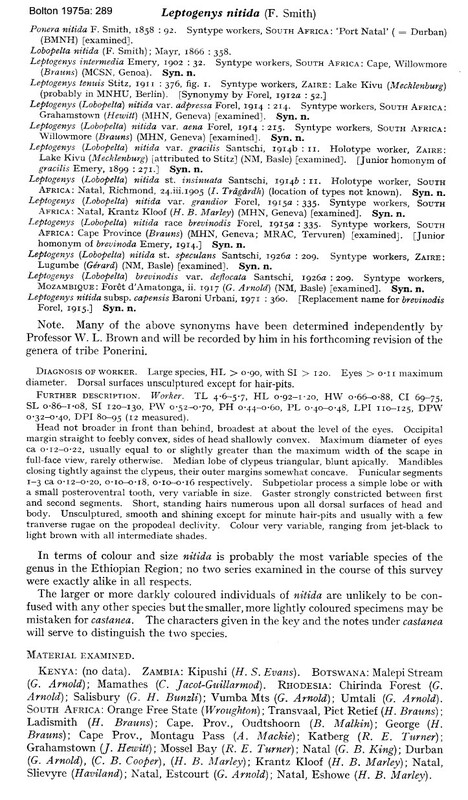 Leptogenys is the most diverse Ponerine genus in the world and is widespread throughout the warmer regions, in a bewildering variety of sizes and habits. 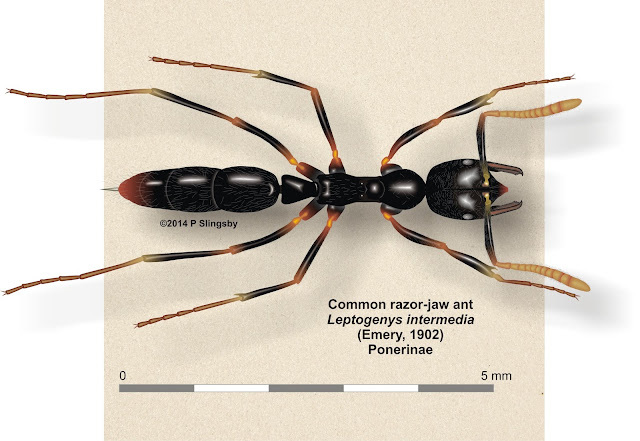 The generic name ‘Leptogenys’ means ‘narrow mandible’ in this context, and indeed most species have narrow, razor-shaped mandibles. Hence too the common name. They are reputed to be specialist predators of isopods [woodlice, etc]. Most species have ‘ergatoid’ queens, i.e. reproductive individuals that are morphologically intermediate between workers and true, winged queens. There are four confirmed species in the Western Cape and a fifth species, Leptogenys mactans, may also occur here. The larger species have powerful stings that can penetrate human skin and cause considerable pain – not to mention the skin-penetrating ability of their sharp, powerful jaws. A medium sized ant, smallish in the genus, occurs in varieties of from 4.5 to 5.5 mm. 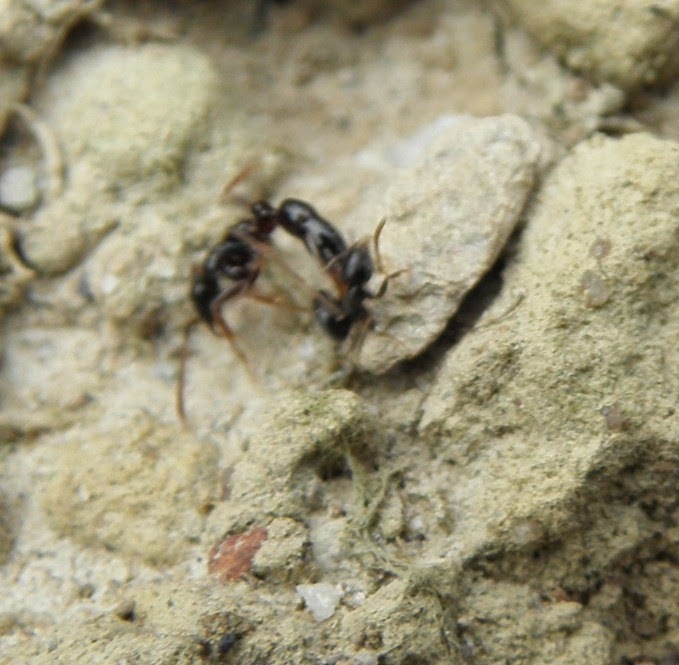 Our specimen was collected from Grootvadersbosch, where the ants were raiding a nest of Axinidris lignicola (Grandfather's wood ant). 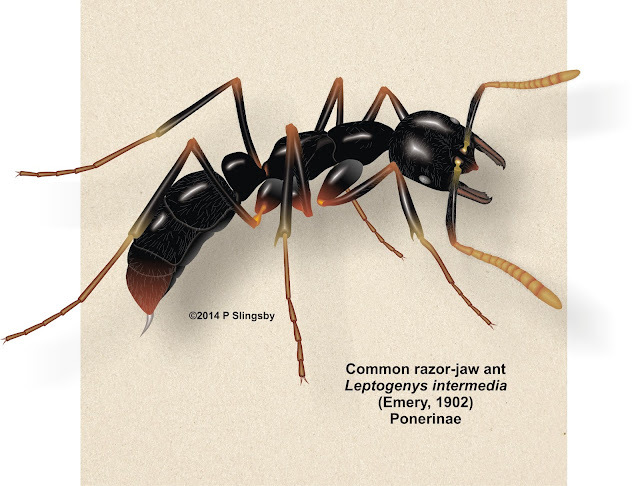 The Leptogenys were seizing the smaller ants in their jaws and immediately stinging them, which appeared to kill the innocents almost instantly. Any pupae or eggs which the victims were carrying were then seized and carried away by the Razor-jaw ants. Our Western Cape variant has been reported from a wide range of habitats and has also been taxonomically characterised as Leptogenys nitida. The species occurs in small colonies of a few hundred individuals and is widespread throughout Africa. Some of the variants are a brownish red colour rather than black, but all have a redder tip to the gaster and paler leg joints and antennae. On a return trip to Grootvadersbosch the ‘victim’ ants (the Axinidris) were still in the same nest, but there was no trace of the Leptogenys. 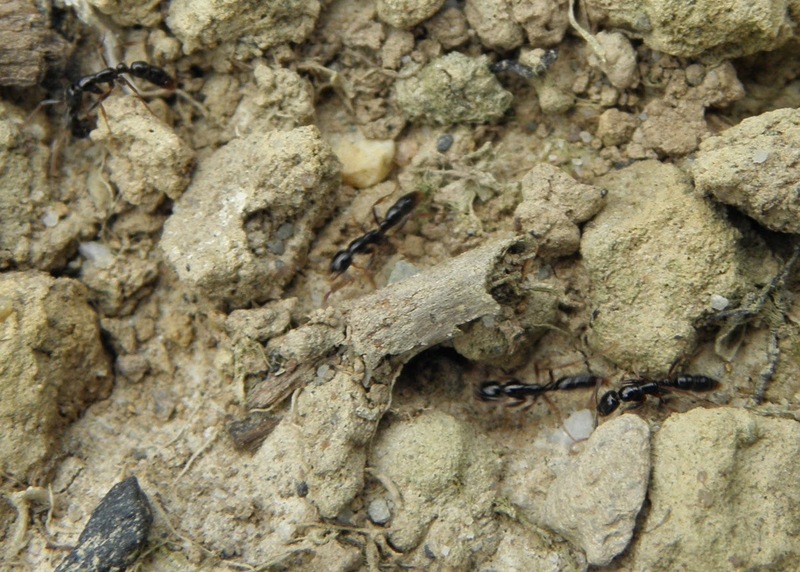 This leads us to suspect that these ants may be nomadic in habit.